The world is watching us. 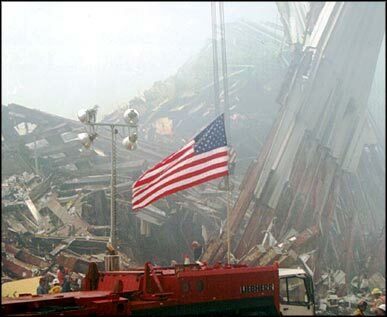 The world watched as America was attacked 10 years ago on September 11, 2001. The world was on our side and some even said, "We are all Americans now." The world had seen many terror attacks before but for the U.S., they are rare. The World Trade Center, of course, was attacked in 1993. And we have had our own internal terror attacks. Timothy McVeigh blew up the Alfed P. Murrah Oklahoma City government center. The Beltway Snipers terrorized the Washington D.C. area for several weeks. Attacks can come in all forms and employ many different kinds of weapons. We now know that jetliners can be weapons. Box cutters can do a lot of damage. Guns were used by Major Hassan when he killed 13 and wounded 29 people at the Fort Hood military base in Texas, by the D.C. snipers and in the attacks in Mumbai, India in 2008. After the September 11 terror attacks, President Bush was mindful of the potential for revenge against all Muslims because of the attacks by some Muslim extremists. On September 17, 2001 he made a statement at a Washington D.C. Mosque surrounded by Muslim Americans. Things had changed in our country. We became more aware of the many Muslims living quietly amongst us. There was more awareness of the Mosques in our country and worry over whether they could become breeding grounds for terrorists. Muslim Americans or Muslims living in the U.S. were looked upon differently after September 11, 2001. There were even some attacks on Mosques after the September 11 attacks by people who showed intolerance towards a whole group after some Muslims attacked our country. Some of the Muslim faith were deported or falsely arrested. And sadly, opposition to the building of a Mosque/Islamic Cultural Center a few blocks from the World Trade Center site caused a furor and outbreak of intolerance by politicians and citizens alike. Understandably, there are Americans who are sensitive to the fact that the terrorists who flew those planes into American buildings were Muslims. There had been some Muslim religious facilities in the World Trade Center even before 9/11. The "Mosque" in question has even been used now as a political negative in a recent ad put out by the New York Republican party. This is a complicated issue, invoking strong feelings on all sides. It seems to me that the best way to resolve it is meet together and gain a better understanding of legitimate issues on both sides- not to jump to all sorts of conclusions and cause problems that make matters worse. Since September 11th, terror attacks have occurred in Spain, England, Mumbai, Russia, Indonesia and, most recently in Norway. The attacks in Norway were particularly unsettling because of the intended victims. Anders Breivik has strong anti-Muslim sentiments and acted on them when he shot 67 people on an island where young people from the Labor party were gathered. Many of these young Norwegians were of the Muslim faith. As a result of the Norway attacks, Muslims living in non-Muslim countries are feeling more vulnerable than ever before. I was made aware of this website, My Fellow American, recently. If you take a look at the video and the writings, you will see a group of Americans who just want to be a part of our country no matter their religious or racial persuasion. There is a pledge on the website that is worded: "Muslims are our fellow Americans.." Most of us don't know what it means to give up much of our culture and try to assimilate into a new world with a new language and new customs. Is it required that immigrants give up everything or can they maintain their religious practices, ways of dressing, language, etc.? We are on new ground now. Globalization, wars, poverty, religious and political persecution have caused some to move to new places hoping for a better life with new opportunities. This is causing citizens world-wide to deal with their own beliefs about people who are not like them. Countries all over the world are becoming more multi-cultural. This has not come without its' problems. Violence has occurred historically because of religious intolerance, intolerance towards those who look, think or act differently, over territory or for revenge. History is littered with the bodies of victims of this violence. The methods have changed. There were once clubs, crude bows and arrows, sling shots, battering rams, shields and swords, knives, early powder guns, sophisticated military weaponry, bombs, IEDs, machine guns, assault rifles and small semi-automatic pistols. During war time, the "enemy" is often demonized and called names in order to get people up for the battle. This intensifies the intolerance. It's easy to be intolerant of others. Our own stain upon history is in sending Japanese Americans to interment camps in the U.S. after the Pearl Harbor attack in 1941. But we also know how the Japanese abused and tortured American prisoners of war during World War II. We are all familiar with the Nazi Concentration Camps in Europe which led to the eventual formation of the state of Israel in the middle east. But the intolerance of the Israeli/Palestinians towards each other has become endemic and has continued almost unabated since the formation of Israel as a country. And we can't forget the treatment of American prisoners of war by the North Vietnamese. Senator John McCain is a survivor of such torture and has been outspoken about torture of prisoners during war time. Most recently, American military has been involved in their own torture of prisoners at Abu Ghraib after their capture in the Iraq war. Other countries practice intolerance towards women, they mistreat children and women and people who are different. In America, we hope to be different and better than that. It's harder to deal with intolerance in a civilized and educated way but it is possible to do something different than we are now doing. From this website, Sojourners, a Christian site which discusses faith, politics and culture and how they intersect: "No doubt, these long wars have fomented unprecedented levels of Islamaphobia back home. This has now culminated in at least 13 states introducing legislation that would ban the use of sharia or Quranic law, which is being stereotyped based on its most extreme interpretations. It is seen as alien to the U.S. and its Constitution, even though that Constitution guarantees freedom of all religions. However, those who are advocating for these bans are labeling sharia as “foreign law,” even though much of our judicial system is modeled on English Common Law." Such legislation is the result of intolerance and fear of those who are different. Our founding fathers would have frowned on such proposals. September 11, 2001 is a prime example of religious and political extremism taken to a tragic and violent end. It remains among the worst terror attacks the world has seen. It happened in America where these things are not supposed to happen. It's disconcerting and frightening to realize that there are people in other places in the world who want to do grievous harm to American citizens. Now, Al Qaeda is weakened but still active all over the world, ready to attack if possible. And so, we remain vigilante but mostly go about our business and live outside of the fear that we could personally become the victims of an attack. We take off our shoes and jackets at airports and go through screeners and scanners just to take a trip to visit relatives. Everything is the same and nothing is the same. Words of intolerance and violence can do a lot of damage. I have written about that many times on this blog. I worry that words will lead to action. And, because I am involved in gun violence prevention, I worry that, in particular, guns will be used to express that intolerance against people who are different. Common sense is what is needed as well as a good hard look at our gun laws. We still have not closed the "terror gap" in our gun laws to make sure that known terrorists cannot purchase guns from federally licensed firearms dealers. Here we are on the 10th anniversary of the September 11th terror attacks and we refuse to close that loophole that could keep us safer from terrorists. We have work to do on this 10th anniversary of the awful attacks on our country. We can do better to keep us all safer from future terror attacks. And we can strive for more tolerance towards those who practice a different religion, who dress differently from us, who look different from us and in most cases just want to live peaceful lives as Americans. This should be true for all countries as we continue to see violent acts towards minorities, women, people of different faiths or sexual orientation and towards fellow citizens in efforts to gain power and control. Human nature sometimes leads to ordinarily unspeakable acts against each other. Unfortunately, we all know that we will see more terror attacks all over the world. As people who have come before us have tried, let us, too, make honest attempts at peace and justice for all. japete: "We still have not closed the "terror gap" in our gun laws to make sure that known terrorists cannot purchase guns from federally licensed firearms dealers." This was supported by Bush Attorney General Alberto Gonzalez, and was just one of many "War on Terror" proposals made by the Bush-Cheney administration -- many of which have been opposed by Americans concerned with Constitutional liberties. japete, we see that you approve of one of the "War on Terror" proposals made by the Bush-Cheney administration -- how many others do you support? "We still have not closed the "terror gap" in our gun laws to make sure that known terrorists cannot purchase guns from federally licensed firearms dealers." We still have not closed the "terror gap" in our gun laws to make sure that people never convicted of a criminal act but put on a secret government list with no due process cannot purchase guns from federally licensed firearms dealers. Thank you, Japete. Coming from a family with mixed races and mixed faiths, I clearly understand the need for tolerance and understanding. Intolerant or hateful words, unfortunately, make a strong impact and take a lot to overcome. We all need to strive for understanding and peace. As for the Terror Gap, there currently is no better way to prevent guns from getting into the hands of potential terrorists, along with demanding a background check and ID of all gun sales, including private sales. Yes, the Terrorist Watch List has profound weaknesses which need addressed, but they pale in comparison to the alternative. "Yes, the Terrorist Watch List has profound weaknesses which need addressed"
So address them. When it's fixed then maybe we can talk.